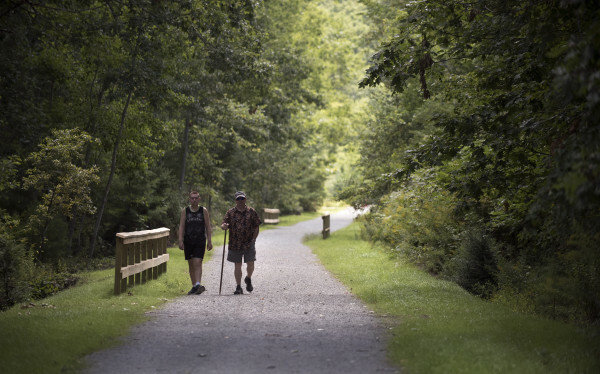 People walk along the new recreational trail Aug. 30 in Belfast. After years of planning and building, the trail along the Passagassawakeag River has become reality. Crews were working on the final section recently near the footbridge on the waterfront. The new recreational trail can be seen Aug. 30 in Belfast. After years of planning and building, the trail along the Passagassawakeag River has become reality. Crews were working on the final section recently near the footbridge on the waterfront. Crews work on the final section of the 2.3-mile-long recreational trail recently near the footbridge on the waterfront in Belfast. After years of planning and building, the trail along the Passagassawakeag River has become reality. Paulette Frye and her husband, David Frye recently talk about how their home is next to the new recreational trail in Belfast. Initially opposed to it, the couple now use the trail and chat with people who pass by their home while exercising. 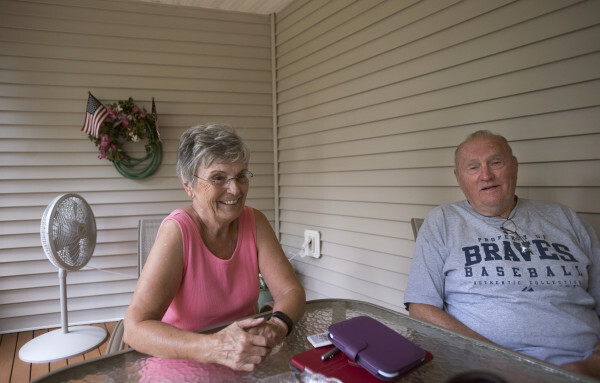 BELFAST, Maine — When retirees David and Paulette Frye learned that the city of Belfast wanted to build a recreational trail across the driveway of their rural home, they weren’t very impressed. “I was against it at first,” Paulette Frye said, adding that she was worried that the sometimes-controversial trail might lure vandals or worse to the tidy house the couple built 16 years ago on the banks of the Passagassawakeag River. But earlier this summer when the long-planned-for path — officially called the Belfast Rail Trail along the Passagassawakeag — was surfaced with a layer of fine stone dust and opened for use, it didn’t take long for the Fryes to change their minds. She loves to walk on the trail and catch glimpses of the ducks, osprey and other wildlife from it. He enjoys greeting the joggers and walkers who pass by their house. About three weeks ago, her husband headed to City Hall to say something to Belfast City Manager Joe Slocum, who worked persistently over the years to make the trail a reality, the couple said. That’s just the start, according to optimistic city officials and others who toiled for nearly 15 years to change the fate of the 2.3-mile portion of the old Belfast & Moosehead Lake railroad line. The standard-gauge railroad operated from 1871 to 2007, carrying both passengers and freight along a 33-mile stretch of track from Belfast to Burnham Junction, although its heyday was in its earlier, busier years. The dream really began to take shape in 2010, when the city of Belfast purchased a 3-mile rail corridor from the Unity Foundation for $200,000. Three years later, the city of Belfast entered into a partnership with the Brooks Preservation Society, the organization that purchased the railroad museum at City Point. From them, Belfast purchased the rights to develop a parking lot, build bathrooms and secure access to the trail’s northern terminus for an initial outlay of $35,000 and additional payments of $5,000 per year for 15 years. The following year, the city’s request to “rail bank” the track between downtown Belfast and City Point was approved by the federal Surface Transportation Board. Rail banking means that the government will allow the railroad to be discontinued for an indefinite amount of time, while retaining an easement to lay tracks there again one day if the need arises. “It was really complicated,” City Councilor Mike Hurley said of the behind the scenes work that had to be done before the tracks could be pulled up and the construction begun. Along the way, the city worked closely with the Camden-based Coastal Mountains Land Trust to help negotiate the acquisition from the Unity Foundation and to raise $400,000 to construct the trail. Ian Stewart, the executive director of the land trust, said that before the rail trail, the land trust had conserved several properties along the river in Belfast. But this particular project has helped his group be perceived as a local land trust working for the people of the city, he said. It took three years to raise the money needed for the trail, Stewart said — a lot longer than land trust officials thought it would. And the project cost less than the initial estimate, Stewart said, because the city’s public works department was able to do a lot of the work and because some bids came in lower than expected. The trail — still a work in progress but nearing completion — is important to Belfast and also as a symbol of something good that is happening throughout the state, he said. But getting the public from downtown Belfast to the trail wasn’t a sure thing until very recently. For years, city officials had been trying to negotiate with the owners of the Penobscot McCrum potato processing plant, located at the southern terminus of the trail, for the right to cross the company’s land and connect the trail with the existing Harbor Walk and downtown Belfast. Earlier this year, negotiations broke down and frustrated city officials began pursuing the use of eminent domain to purchase a recreation easement across the company’s land. In early August, owner Jay McCrum changed the tone of the conversation when he offered to build a trail and lease it to the city. 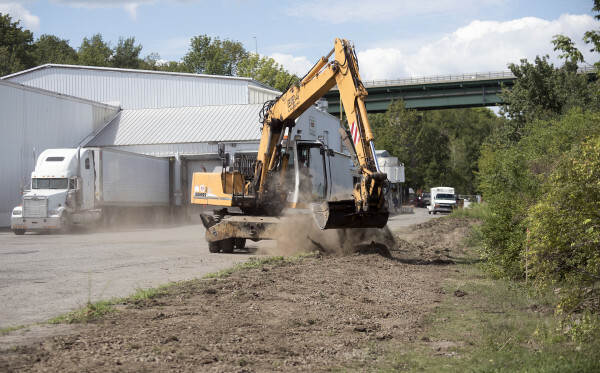 On Monday, Aug. 29, the city of Belfast entered into an agreement with Penobscot McCrum to put in a temporary access path through the factory’s land, and work began the next day to make that happen. Belfast City Planner Wayne Marshall said that work on a permanent trail — which will include a wooden boardwalk around the company’s propane tanks — is likely to be completed this fall. McCrum said Thursday that he is happy with the outcome, adding that the company will work closely with the city to manage the trail so that users will be safe when they cross the property. City officials said they really appreciate McCrum’s generosity. Hurley said that the city’s focus on recreational paths, including the Harbor Walk and the new rail trail, has been a true game-changer for Belfast. Once the connection is completed — which McCrum said he expects will happen very soon — it will mean that a walker, jogger, wheelchair user or cyclist can travel 3 miles along a connected series of paths that begin at the harbor and the working waterfront then wend along the bucolic river to City Point. The Belfast Rail Trail along the Passagassawakeag can be most easily accessed via the City Point railroad museum at 13 Oak Hill Road in Belfast or via the Upper Bridge parking lot on High Street. 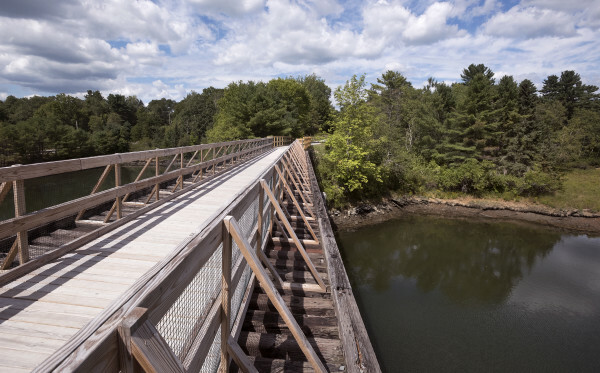 Soon, it will be accessible from downtown Belfast through Penobscot McCrum-owned land off Footbridge Road.